Accel Technologies develops secure electronic check and form printing solutions for Laser Printers and Laser MICR Printers operating in any operating system environment. Resellers worldwide have sold thousands of Check-Secure units as a security storage adjunct to their core financial, payroll, and forms automation solutions. Check-Secure can stores hundreds of thousands of digitized forms, checks, signatures, special fonts (such as MICR, OCR, Barcodes and more) at the laser printer level, for accessibility at the laser or inkjet printer level - thus relieving server storage and processing cycles. Please contact Accel at (800) 693-3933, for information on becoming a business partner or distributor. 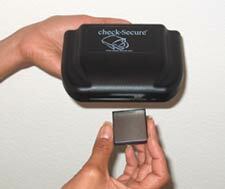 Please visit our contact page to receive a free 21-day Check-Secure evaluation kit. Check-Secure is a product by ACCEL Technologies that was developed to address the growing needs of the electronic document industry for open platform electronic document integration and to enhance control and security of electronic (laser) check and signature printing.